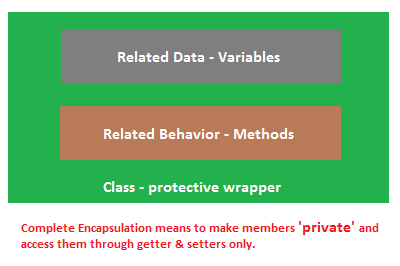 So, we can conclude our discussion saying that, Encapsulation is reflected with a well defined class having all related data and behavior in a single place and than access/restrict it using appropriate access modifiers. This is one of the most frequently asked and discussed question in Java. Encapsulation and Abstraction are purely different scenarios. Abstraction means to have a non-concrete manner of implementation either using abstract classes or interfaces. Abstraction means to define methods whose purpose is to be extended/implemented only. Think of an example of ?Animal? abstract class or interface, here we can define all possible behavior of an animal like, color, weight ..etc. Every animal will have these behaviors but the implementation will be particularly different for each class that implements or extends abstract implementation. Here we are done with 'Encapsulation in Java - Example and Explanation'. In our upcoming blogs we will see more about Java Programming and other opensource technologies.